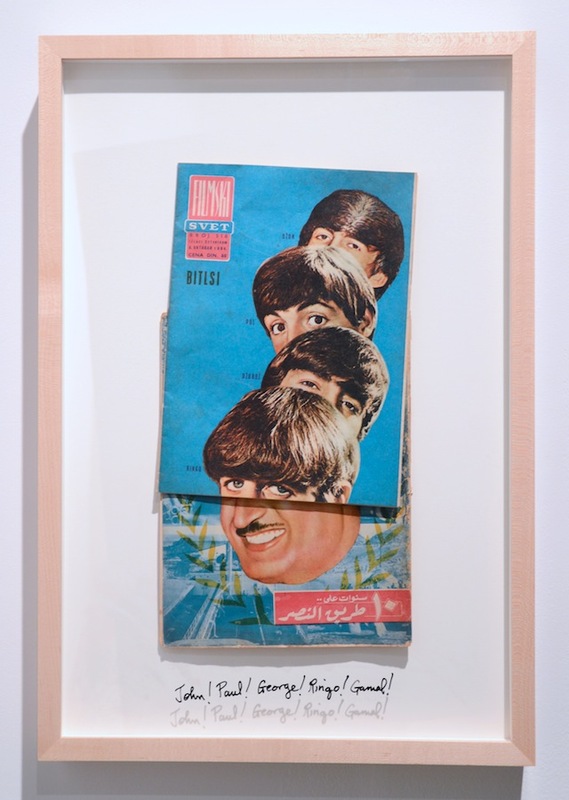 Michael Rakowitz, “John! Paul! George! Ringo! Gamal!” (2014). Yugoslav Flimski Svet magazine (translation = Movie World) October 8, 1964 on Al Musawar magazine, 1960 23.75 x 16.75 inches, framed. All images courtesy of Rhona Hoffman Gallery. CHICAGO — Iraqi-American conceptual artist Michael Rakowitz works in a liminal space between fantasy and reality, much like an artist who makes fan art. This is a compliment and a reality, for it’s impossible to think about the artist without thinking about fandom; what contemporary artist is not inspired greatly by another artist, writer, band, historical time period, or even specific materials? In this sense, every great artist is a super fan — but not everyone will admit to it. Michael Rakowitz is one of those exceptions. Michael Rakowitz, “Study for the Breakup – Fantasy Objects” (2012). Vitrine of objects and ephemera. The Breakup is massive, taking over the sprawling gallery like a Beatles version of a sports memorabilia store, a glass-box-filled museum of important historical artifacts, and a secret movie theater. 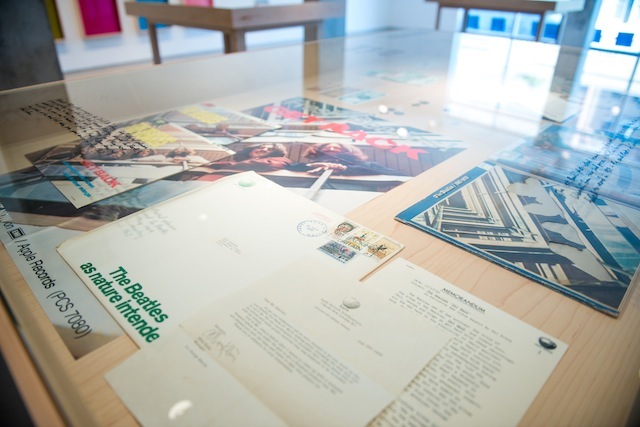 Rakowitz arranges memorabilia, a row of records from the remake of the Beatles’ last concert that he staged at the Al-Ma’mal Foundation for Contemporary Art in 2010, and a 45-minute video on the second floor that takes viewers through disjointed connections that the artist draws between the breakdown of West Asian political relations and the breakup of The Beatles. Michael Rakowitz, “The Collapse” (2014). Luxe Iraqi cigarette box (full), 1932; Daily Mirror newspaper, August 28, 1967, 29.25 x 22 inches, framed. Epstein was credited with transforming four individuals — John Lennon, Paul McCartney, George Harrison and Ringo Star — into a singular entity that was known as The Beatles. Epstein unified these individualistic artistic men, and when he died that unity collapsed. Could the same be said about the attempts at a single unified Arab state, which suffered with the Arab armies’ defeat by Israel in the Six-Day War between June 5–10, 1967. Epstein died on August 27, 1967 in London, just a few months after the Six-Day War. What does that have to do with the Middle East? Were these all just events that occurred during the same time period? 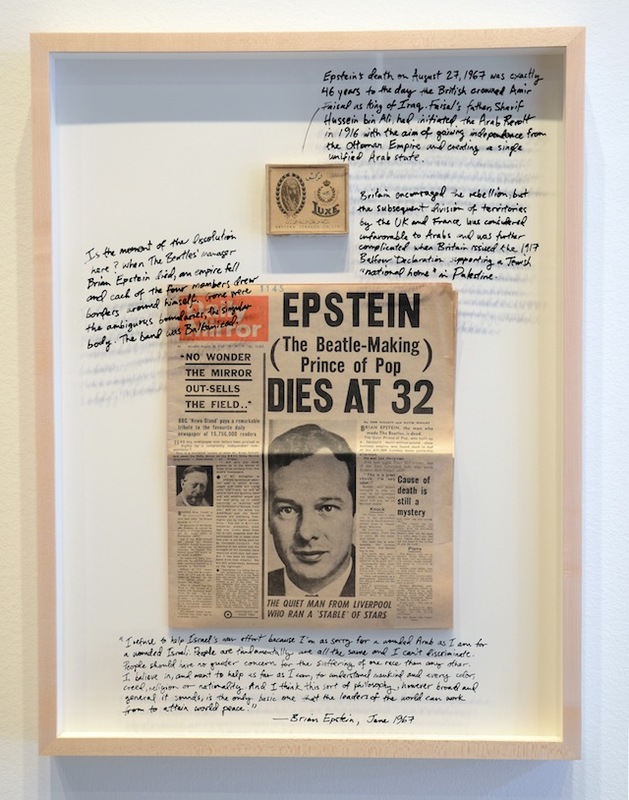 Questions, connections, and tangents like these spring up through Rakowitz’s exhibition, and it’s up to the viewer to piece them together based on the evidence provided by the artist and their own research capabilities — if they care to do so. Installation shot of Michael Rakowitz’s exhibition “The Breakup” (2014) at Rhona Hoffman Gallery. 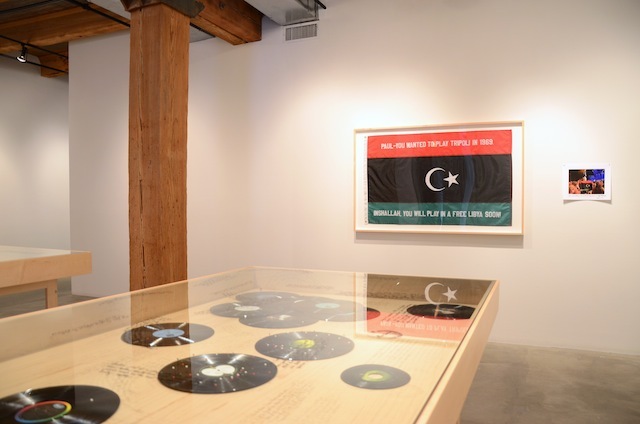 The Breakup is similar to Rakowitz’s seemingly impossible exhibition Spoils (2011), in which Creative Time purchased plates that were believed to have been looted from Sadaam Hussein’s palace for the artist off eBay. The artist used those plates to serve dinner to art patrons at Park Avenue Autumn; shortly thereafter, they were confiscated by the Iraqi mission. The art-induced creative transference of these now-empty power signifiers occurred on the internet; the physical manifestation occurred on American soil and was performed in the space of an art gallery. All who chose to participate did so to exist in this liminal space created by Rakowitz for contemplating US-Middle Eastern relations. Like The Breakup, “Spoils” created an immersive experience and alternative, fantastical reality. 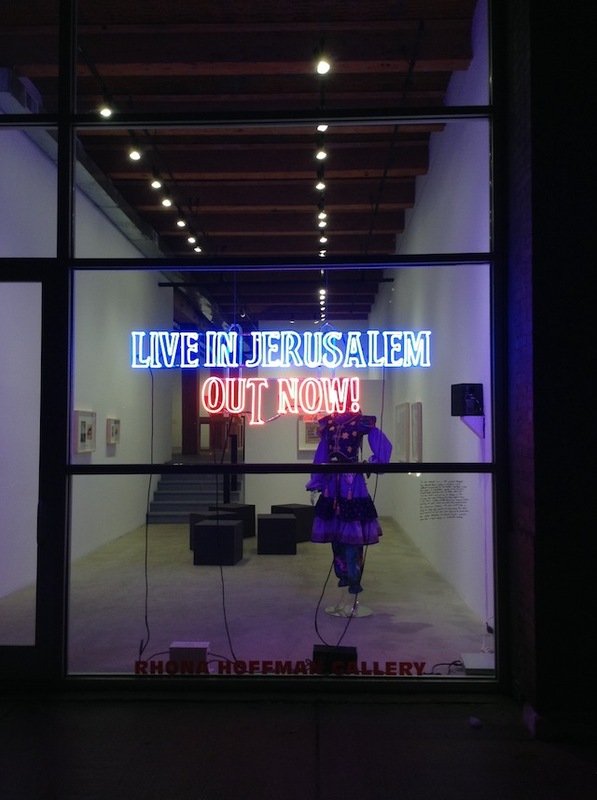 Michael Rakowitz, “Live in Jerusalem, Out Now!” 2014. Neon, 23 x 72 inches. Unlike a maze that offers an end point, The Breakup works because it makes no sense, taking viewers on a meandering trip that only produces more questions, and leaving them with dinner table conversations to be held over household plates. The only piece in the exhibition that offers some sort of conclusive look is the remixed cover of Sgt. 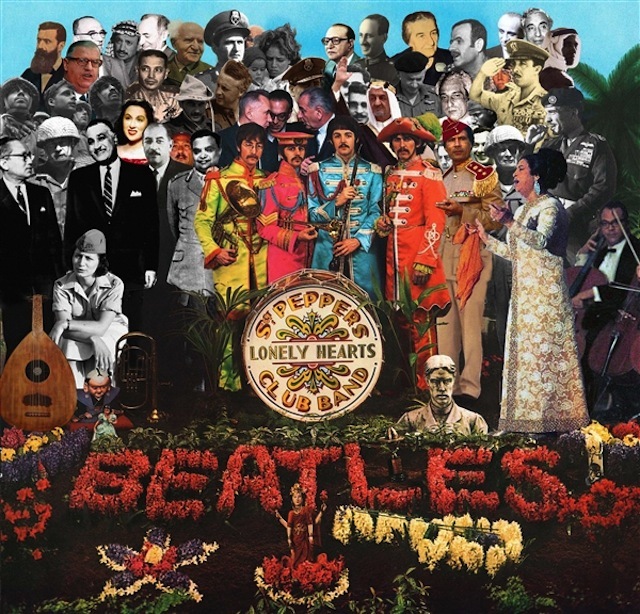 Pepper’s Lonely Hearts Club Band, which collages together major players from the worlds of The Beatles and West Asia and North Africa. Finally here — with George Harrison next to Muammar Gaddafi — does Rakowitz ensure that everyone comes together, right now, to listen, talk, remember and wonder, but never to know. Michael Rakowitz, “The Breakup” (2012). Collage on found album sleeve, 12 x 12 inches. Michael Rakowitz’s The Breakup continues through February 22 at Rhona Hoffman Gallery (118 N Peoria #1A, Chicago).